Mattel is shipping out their new two packs in a rather unusual fashion, switching out sets from the first cases to replace them with the later sets slowly. Or not so slowly, depending on how you want to look at it. 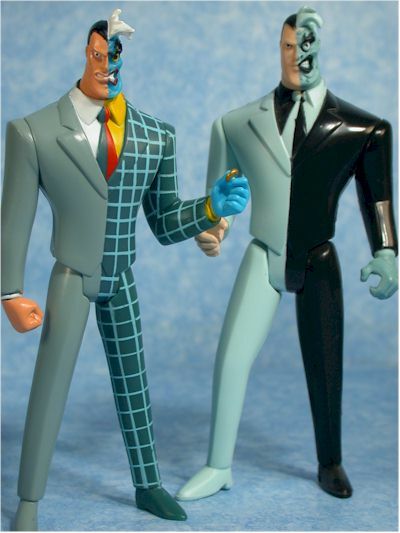 The newest case assortments now include the Tech Suit Batman and Two Face. The cases no longer contain the Catwoman two pack I reviewed earlier, so I'd pick one of those up now if I were you. The Batgirl set has been rumored in some locations, but I haven't found it yet. It should replace the Batman/Nightwing two pack in future case assortments. These are showing up at Toys R Us and the Musicland family of stores (Sam Goody, Media Play, Musicland) right now, and should start hitting Target soon. Target has the best retail right now, at $9.99. I like this style of packaging, and while it isn't collector friendly, no carded packaging really is. At least here you are getting a very sturdy bubble and card, with good graphics (I really like the use of the unique insets showing the characters), and basic text. The embossed look of the Batman logo is a highlight. 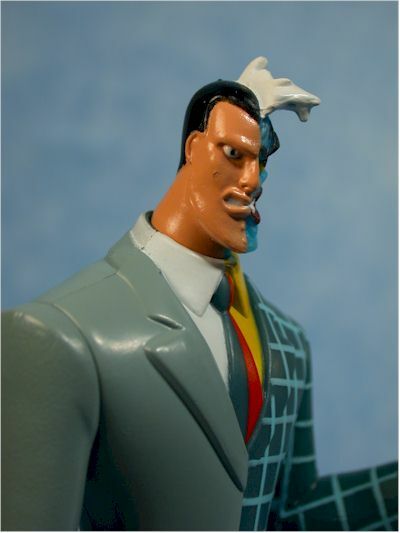 The sculpts aren't bad, but I'm bothered a bit by something about the Two Face sculpt. 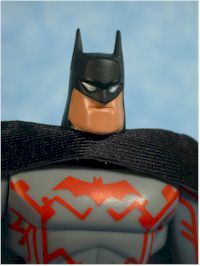 Batman is the same sculpt we've seen in all the other two packs with a different paint job. Mattel is doing their best to catch up to Hasbro as quickly as possible. 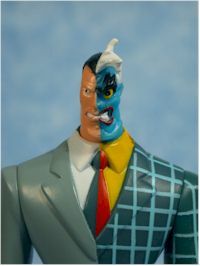 Two Face is a nice, new sculpt, based on the New Batman Adventures. In some ways he's an improvement, and I prefer the slightly more svelte, smaller scale than the previous Hasbro versions. But this poor guy is definitely suffering from pin head disease. His head is quite tiny on his shoulders, even with the reduced size of his body. It stands out when placed next to the other figures, and the rooster hair he has on top of his head is even more prominent when resting on this peanut. It's a great sculpt, I just wish it was a tad bigger. The paint application on the Tech Suit Batman is solid, with little bleed and lots of good detail work on the 'tech' part. This particular repaint may not be your cup of tea, but he is painted well. 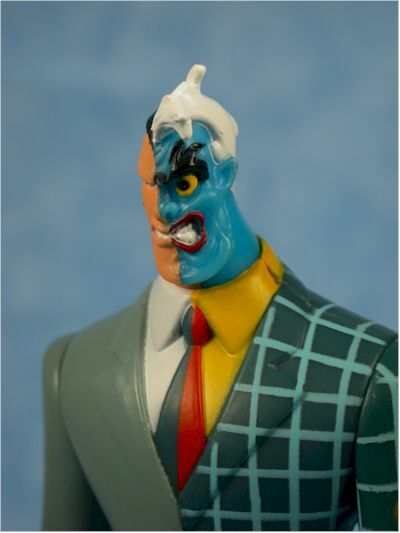 The paint work on Two Face isn't quite as clean in my set. There's some bleed and poor definition between several of the suit colors, and the face isn't quite as well done. I do like the color choices though, and the striping on the left half of the suit is excellent. Just like Hasbro, Mattel is giving us five points - neck, shoulders and hips. I'm not thrilled, but it could certainly be worse. It works better for Batman than it does for the villains, since the 'maquette' style pose they've given him gives an impression of power and attitude. Fortunately, the poses given to the villains so far all allow them to stand fine on their own. This continues to be a big negative for this line. 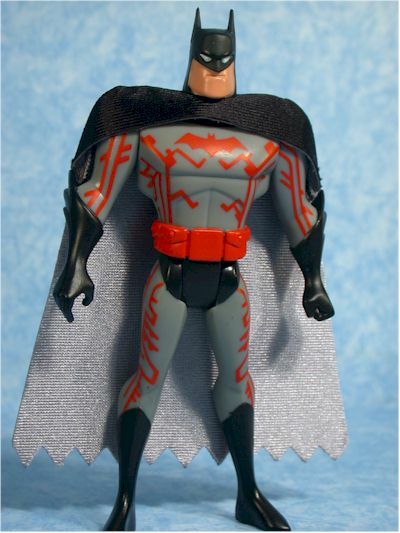 Again, neither figure comes with any accessories, although you could stretch it and say Batman's cloth cape (very well done and well tailored too) is an accessory. I wouldn't, but you could. 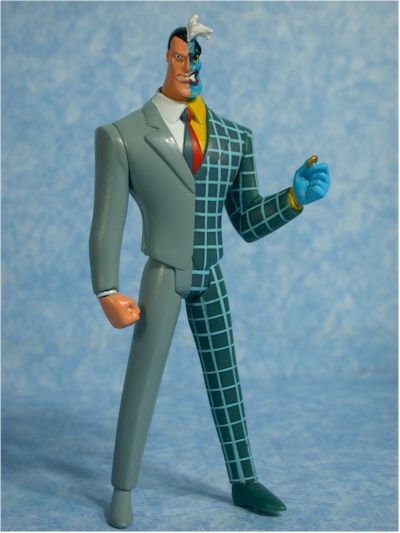 Two Face does have a coin sculpted into his left hand, and considering how small the coin has to be in this scale, that's fine. But a gun would have been nice, or at least an open right hand sculpt to allow him to hold a gun. At ten to twelve bucks a set, you're paying five to six bucks each for these figures. With no accessories of any kind, no display stand, just a figure, that's a couple bucks more than they are really worth. The ten buck mark isn't terrible though, so do what you can to find these at Target. 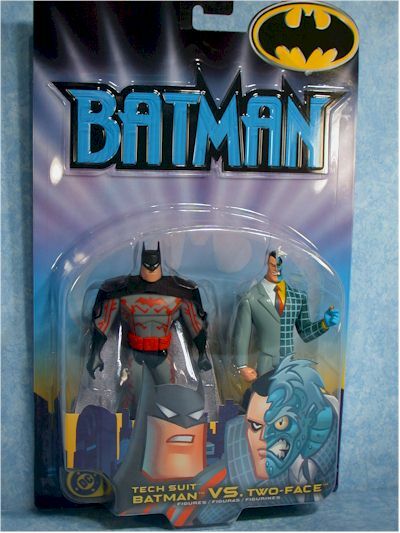 Don't get me wrong - I'm happy to have some new animated Batman figures on the shelf. Of course, I'd prefer if a) they had some accessories and b) they were really new, and not just more versions of the figures we already have. So far Catwoman has fit the bill the best, but I have hopes that if these sell well we'll see some TNBA versions of other villains that we haven't gotten before. Target is your best bet, although I've seen them at Media Play and Toys R Us already as well.